Net metering gives solar customers credit for the surplus electricity that they can provide to the electric grid. WASHINGTON — Three years ago, the nation’s top utility executives gathered at a Colorado resort to hear warnings about a grave new threat to operators of America’s electric grid: not superstorms or cyberattacks, but rooftop solar panels. If demand for residential solar continued to soar, traditional utilities could soon face serious problems, from declining retail sales and a loss of customers to ‘‘potential obsolescence,’’ according to a presentation prepared for the group. ‘‘Industry must prepare an action plan to address the challenges,’’ it said. The warning, delivered to a private meeting of the utility industry’s main trade association, became a call to arms for electricity providers in nearly every corner of the nation. Three years later, the industry and its fossil-fuel supporters are waging a determined campaign to stop a home-solar insurgency that is rattling the boardrooms of the country’s government-regulated electric monopolies. More recently, the battle has shifted to public utility commissions, where industry backers have mounted a more successful push for fee hikes that could put solar panels out of reach for many potential customers. In a closely watched case last month, an Arizona utility voted to impose a monthly surcharge of about $50 for net metering, a common practice that gives solar customers credit for the surplus electricity they provide to the electric grid. Net metering makes home solar affordable by sharply lowering electric bills to offset the $10,000 to $30,000 cost of rooftop panels. A Wisconsin utilities commission approved a similar surcharge for solar users last year, and a New Mexico regulator also is considering raising fees. 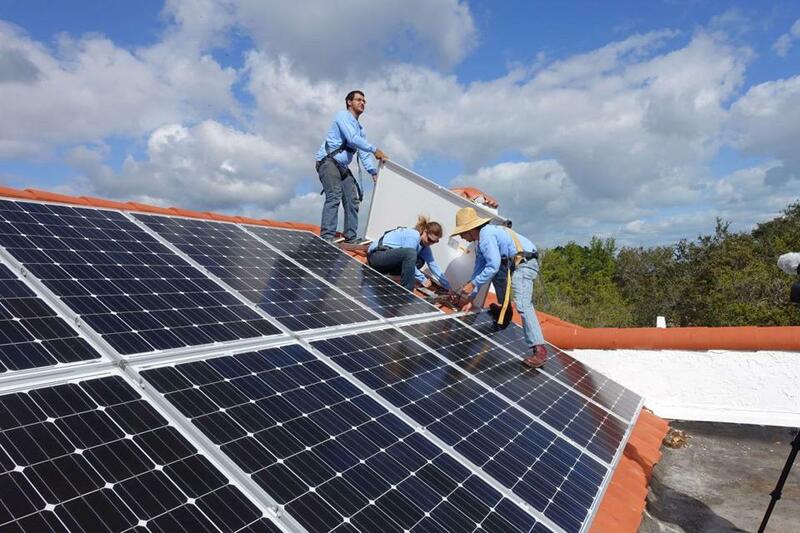 In some states, industry officials have enlisted the help of minority groups in arguing that solar panels hurt low-income people by driving up electricity rates for everyone else. ‘‘The utilities are fighting tooth and nail,’’ said Scott Peterson, director of the Checks and Balances Project, a Virginia nonprofit group that investigates lobbyists’ ties to regulatory agencies. Peterson, who has tracked the industry’s two-year legislative fight, said the pivot to public utility commissions moves the battle to friendlier terrain for utilities. The commissions, usually made up of political appointees, ‘‘have enormous power, and no one really watches them,’’ Peterson said. Industry officials say they support their customers’ right to generate electricity on their own property, but they say rooftop solar’s new popularity is creating a cost imbalance. While homeowners with solar panels usually see dramatic reductions in their electric bills, they still rely on the grid for electricity at night and on cloudy days. The utility collects less revenue, even though the infrastructure costs — from expensive power plants to transmission lines and maintenance crews — remain the same. Ultimately, someone pays those costs, said David K. Owens, an executive vice president for Edison Electric Institute, the trade association that represents the nation’s investor-owned utilities. ‘It’s not about profits; it’s about protecting customers. There are unreasonable cost shifts’ with solar. Whether home-solar systems add significant costs to electric grids is the subject of intense debate. A Louisiana study last month concluded that solar roofs had resulted in cost shifts of more than $2 million that must be borne by Louisiana customers who lack solar panels. That study was disputed by clean-energy groups that pointed to extensive ties between the report’s authors and the fossil-fuel lobby. Other studies commissioned by state regulators in Nevada and Mississippi found that costs can be outweighed by benefits. For one thing, researchers found, the excess energy generated by solar panels helps reduce the strain on electric grids on summer days when demand soars and utilities are forced to buy additional power at high rates.